Renowned Chef Marcus Samuelsson recently joined the American Table Café and Bar, which is located at the Lincoln Center’s Alice Tully Hall in Manhattan, NY. To mark the event, the architecture firm Diller Scofidio + Renfro (DS+R) renovated the restaurant’s interior and exterior. Fproduct, Inc., in collaboration with DS+R, was commissioned to design and produce six outdoor cushions for the cafe’s exterior stone plaza using Fproduct’s innovative Gel Pal material. The rectangular silicone gel cushions have a slim vertical extension for stability and can comfortably accommodate two individuals. 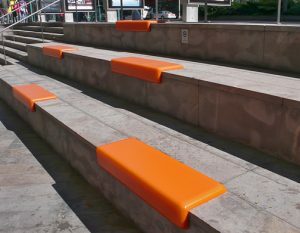 The vibrant orange color of the gel cushions also aesthetically complements the interior renovations, thus creating a visual link with the cafe.